Can you remember the last time you had a look under the bonnet of your car? If you haven’t looked in a while, you’re not alone. Modern cars are more reliable than ever. That means the things we should regularly check – like oil levels – often slip our mind. No wonder we’re less likely than ever to check we have the correct tyre pressure. When it comes to tyre pressures too much or too little air can both be dangerous. Incorrectly inflated tyres wear out unevenly and need replacing more often. These are dangerous because they directly affect the way your car handles and stops. Since under-inflated tyres are softer, they can increase the chances of you getting a puncture. Under-inflated tyres wear more quickly at the edges, which affects handling. With over-inflated tyres, the risk of high-speed blow-outs increases as there is less ’give‘ in the tyre. A high-speed blow-out is extremely dangerous. Over-inflated tyres wear more in the centre, resulting losing tread right where it makes the most contact with the road. All new vehicles sold in the EU now must have a Tyre Pressure Monitoring System (TPMS) installed. This technology uses sensor valves to monitor each tyre’s pressure. If the tyre pressure drops suddenly, then a warning light alerts the driver to check the pressure manually. If your vehicle has TPMS, you need to ensure it is maintained by a qualified technician. A faulty TPMS will automatically fail your MOT. It is recommended that you check tyre pressures at least once a month. Tyre pressure readings are more accurate when tyres are cold so check them before you begin a journey. You will find your vehicle’s correct tyre pressure values on the inside of the fuel cap, or on a plate inside the driver door. Either top up or release air until the pressures are correct. Repeat for all wheels – don’t forget the spare! Here at the Car Clinic MOT Centre Ellesmere Port we supply & fit all makes and sizes. For your peace of mind, our tyres come with free valves, balancing and fitting. We fit all brands of tyre manufacturers, and offer a drive in, drive out service. 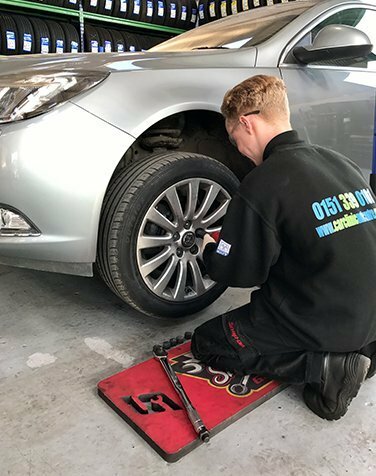 For a free Ellesmere Port car repairs quote or Ellesmere Port tyres quote just give us a call on 0151 3390101 or pop in at your convenience.